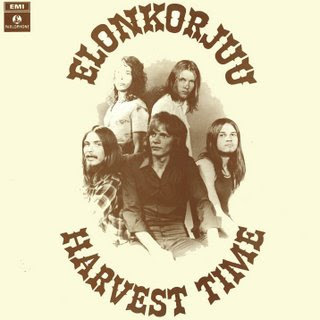 "Elonkorjuu" is the Finnish word for "harvest time", in case you wondered. This young group from Pori was among the most promising new groups of their era but sadly only left us with one album of excellent heavy rock influenced by Jethro Tull, Deep Purple and Led Zeppelin. Songs such as "Praise To Our Basement" indicates they were a garage band, but were far more subtle than that, often playing sentimental pieces with dynamic developments and good use of the Hammond organ and flute to counterbalance the guitars.